Spider-Man: Homecoming – 4K Ultra HD Blu-ray review | What Hi-Fi? Spider-Man: Homecoming spins a tangled web on 4K, but is it enough to capture our attention? With Avengers: Infinity War now in cinemas, it seems a good moment to take stock of the 4K Blu-ray releases in the Marvel Cinematic Universe. So how does Spider-Man: Homecoming measure against Guardians Of The Galaxy: Vol 2 and Thor: Ragnarok?. The story sees Peter Parker re-adjust to life after the events of Civil War. Hoping to become a permanent member of the Avengers, Parker sees a chance to impress Tony Stark when he learns of an individual called The Vulture selling repurposed alien tech on the black market. Will he be able to step up and defeat The Vulture, or is he in over his head? Homecoming takes its inspiration from the John Hughes comedies of the 1980s (Ferris Bueller's Day Off, The Breakfast Club), meshing high school drama with superhero theatrics in a way that brings a youthful, fresher tone to the MCU. The story has thrills and laughs, but pick at the threads in places and the logic is less than sound. The journey Parker goes on is one of personal growth, but the lesson he learns is confused in its execution. When he acts rashly, he's admonished for getting in over his head, but when he does the same thing and saves the day, he's fêted. The action scenes are directed with energy by Jon Watts, but lack subtlety. The use of CG effects are noticeable and, like the recent Black Panther, its presence introduces a whiff of artificiality, breaking up the feeling of immersion in some scenes. It's on surer footing when the story turns its attention to Parker's relationships. This is where much of the film's charm and fun is found, thanks to engaging performances from the impressively diverse cast and, in particular, from Tom Holland. Every superhero film needs a villain who goes tête-à-tête with the hero, and Homecoming has that in Michael Keaton's Vulture. He's far from one-dimensional, with a logic that underpins his actions and motivations. Whenever he and Spider-Man face off, there's a real sense of danger. The film is more down-to-earth than either Thor or Guardians – the humour and geekery on show here are appealing, but it doesn't forget to have fun. For re-establishing the Spider-Man character, Homecoming belongs among the MCU's better efforts. Spider-Man: Homecoming was shot digitally on Arri Alexa cameras at 2.8K and received a 2K digital intermediate for its theatrical release. Assuming it was the source used for the UHD, that makes this an upscaled release. The disc comes with both HDR10 and Dolby Vision encodes. We only have access to HDR10, and it's a pleasing enough image. The range of tones available are more noticeable and colours themselves tend to have solidity and punch. The red and blue of Spider-Man's suit is firmer in its rendition, for example. As you'd expect, there are improvements to fine detail, with lines more sharply etched and a better sense of definition to objects and faces. Complexions are solid throughout and appear faithfully rendered. The contrast receives a boost, with the clouds in the background of the ferry sequence appearing more realistic than on the Full HD Blu-ray. Black performance presents a slight issue. There's depth, but not of the inky black persuasion. What's more surprising is that the film's dimly lit scenes feature some noise. It isn't too glaring, but it's odd to see. It's a fine picture with a range of improvements over the Blu-ray. But compared with Ragnarok and Guardians Vol.2, it falls short of offering a favourable all-round performance. The Atmos track is loud and intense and, as with Guardians Vol. 2, it strikes a good balance between detail and heft. There's weight to sounds – explosions are cacophonous – but detail is still tangible and sounds rendered with clarity. The track maintains a presence in the height channels. 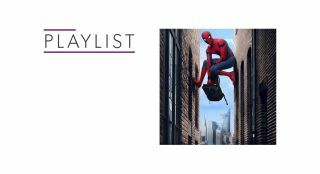 Some uses of Atmos are more obvious, but the subtler moments are noticeable too, such as the Washington Monument sequence where the lift noises and Spider-Man's webbing extend above. Effects are well positioned, creating a good sense of depth and spatial awareness in the track. And there are several instances where the audio becomes subjective, which briefly invite you into Parker's headspace. This almost makes up for the lack of 'spidey-sense'. Bass is louder and more satisfyingly 'rumbly' compared with a 4K disc such as Thor: Ragnarok. Giacchino's score is excellent, with memorable hero and villain themes. Dialogue is centred and clear, even when characters mouths are obscured by masks. This Atmos track places an emphasis on power and scale, and that makes for a highly listenable soundtrack. Spider-Man was welcomed to the Marvel fold in Civil War and with Homecoming, the character looks set to become a mainstay of the MCU. The film is fun, charming and consistently enjoyable. Some of the quirks in the story and character department could do with ironing out, but it's a fine effort that bodes well for future instalments. The UHD performance is good, the Atmos soundtrack is a whizz-bang affair with lots of fireworks and the picture is enjoyable, though it comes with a few caveats. Compared with Disney's 4K releases, it matches and occasionally betters them in the sound department. However, visually, this Sony release isn't quite an all-round match. With the character returning in Avengers: Infinity War and destined for a sequel (some of which takes place in London), we're intrigued to see where this series will go next.